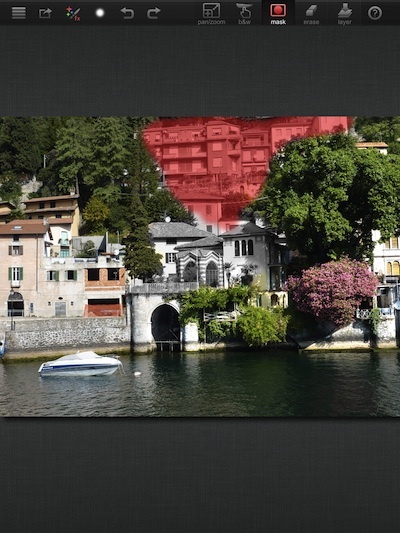 We have gone into quite a bit of detail around advanced photo editing tools on the iPad. There are of course simple tools to apply a effect filter to a full pictures but beyond that usually means tools that take a while to learn and get good with. An app that on the surface appeared too simple has turned out to be a great find, letting us to pinpoint tuning of images without complicated steps. The app, Paint FX Photo Effects Editor (say that 10 times fast), has both the full image effects and pin point editing capabilities. 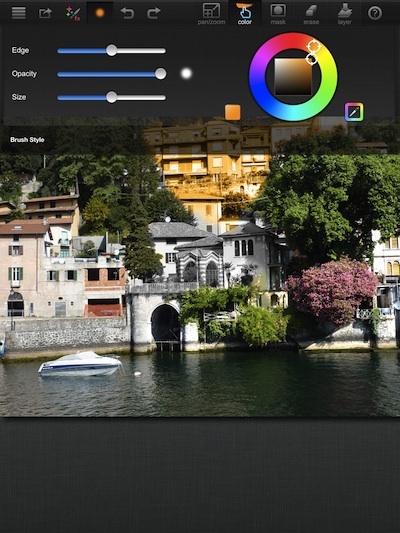 Paint FX Photo Effects Editor has a group of filters/effects built in to use. Select the color icon along the top to show the options. 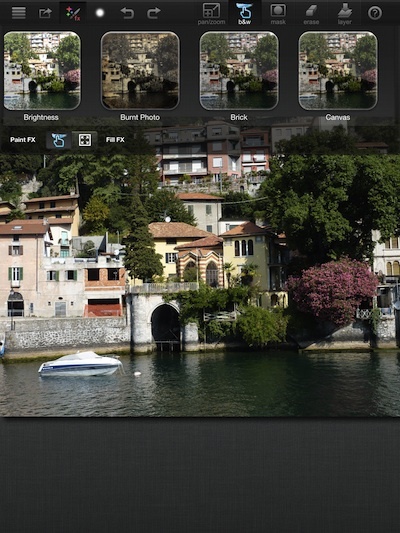 Without over complicating the application of the filters, the app lets you apply more than one effect by using Layers. Choose a effect, apply it to tune the areas of the photo, select ‘layer’, then another effect to do more tuning. Just under the photo effect options is two buttons that allow for the effect to be applied to the full image or to have the effect applied only where you brush over. 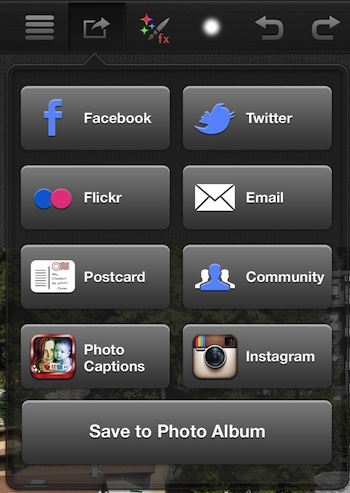 The ‘finger’ icon’s name changes to the filter being applied. We chose the the Brightness effect and ‘painted’ in the trees on the right to brighten and make them stand out more. Paint FX Photo’s effect precision of application means you could make an area of a photo black and white, make an area really pop, maybe even change the effect for an area so it looks hand drawn. Since it is easy to apply/undo, you can work your way through a lot of tuning options quicker than the more expensive options. The ‘mask’ button shows a red tint to the area your applying the effect to. The ‘mask’ option doesn’t have to be on all the time, it can be flipped on/off as needed. When doing fine tuning, the application of the effect can be hard to see so the coloring really helps. 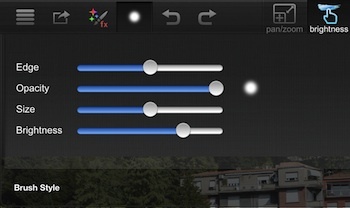 When using the option to paint the effect rather than applying to the full image, Paint FX Photo has tuning options for the paint brush tool beneath the ‘dot’ button. Interesting there is so much power to edit, but it appears there is no way to crop an image. 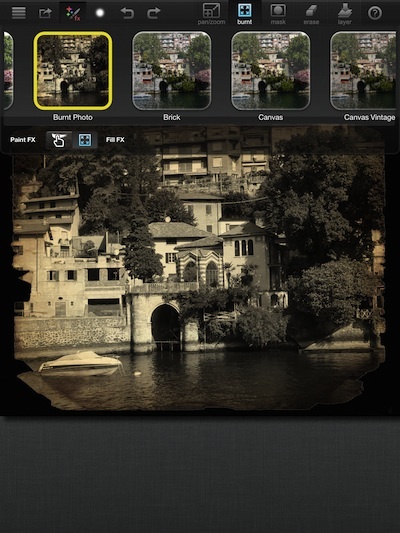 One of the photo filters you can choose is ‘Color’. 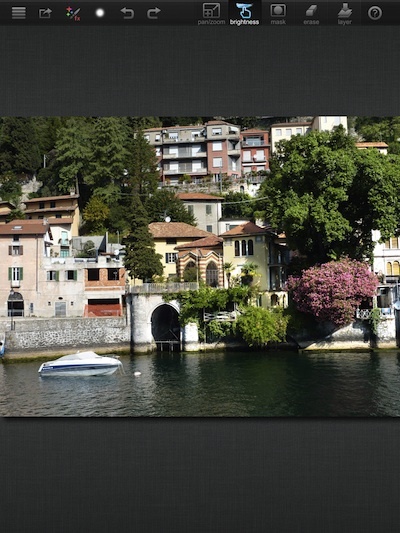 The Brush tuning now has the added ability to choose a color, then just paint that color onto your photo. Change the color of someone’s eyes, a building, a fence, even the sky. When your first starting off, Paint FX Photo Effects Editor allows you to pull in your photos from a variety of places that you may be using. When the image is as you want it to be, save it to your iPad’s photo library, attach it to an email, send to popular social and photo sharing services. 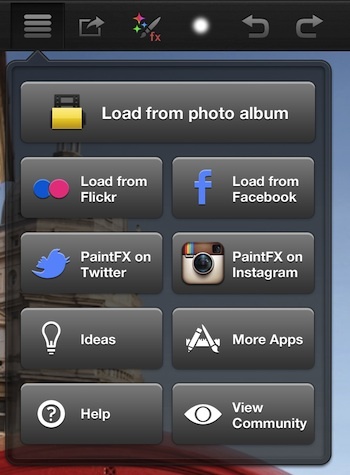 Postcards can be sent to a printing service (extra charge) and the developers of Paint FX Photo Effects Editor threw in an option to buy their app to add captions to your photos too.